by Daniel Kahneman. New York: Farrar, Strass, and Giroux, 2011. 499 pp. 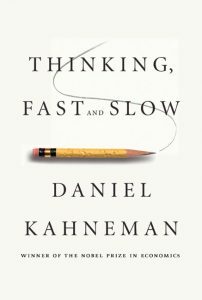 Daniel Kahneman is the emeritus Eugene Higgens professor of psychology and the emeritus professor of psychology and public affairs at the Woodrow Wilson School of Public Affairs, both at Princeton University. He is author or coauthor of six other books, and the winner of the Nobel Prize in Economics (with Amos Tversky) for work in decision theory. The major premise of the book is that the human brain operates as if (because this is the way the brain behaves, not the way it is structured) it had two systems. The first (he calls system 1) responds quickly, intuitively, doing pattern matching. The second (called system 2), is the rational part of our brain that responds more slowly and carefully, sometimes referred to as the rational response. It is the relationship between these two systems, the subject of numerous experiments throughout the book, that may be surprising to most of us who think we are rational. System 2 is “lazy” and allows system 1 to make most of our decisions for us. When called upon, it often develops a rational argument for the response of system 1, whether or not that response was correct. Would you accept a gamble that offers a 10 percent chance to win $95 and a 90 percent chance to lose $5? Would you pay $5 to participate in a lottery that offers a 10 percent chance to win $100 and a 90 percent chance to win nothing? A much higher percent of people would agree with 2 but not with 1! We are distracted by meaningless “facts” when we make decisions. Those who were asked if Ghandi reached 144 years old and then asked to estimate his age when he died guessed a substantially higher age than if they were first asked if he had reached age 35. Judges were shown a die before sentencing criminals, and those sentenced after the judge saw a six consistently received longer sentences than after the judge saw a three. Our mind wants to identify cause and effect for almost any situation, when often the facts can best be explained by random events. No football commentator can finish a game without “explaining” why one team lost or won, when it may be a matter of inches and luck. No stock analyst can see a drop without explaining it when the explanation may be completely bogus. The experiments are endless, it seems, and mostly fun with a serious overtone. The author even acknowledges that, despite studying this field for many years, he is not very good at identifying when he is jumping to an invalid conclusion, though he has gotten better in seeing this in others! In several places, he inadvertently illustrated this by trying to explain, for example, why one person would buy a stock that another person was selling. I marked several places where I thought he had leaped to a conclusion not supported, but after reading the whole of the book concluded I was less sure I was right! In my favorite chapter (22) the author worked together with one of his critics to explore the way the context of each person’s work had led them to different conclusions, and they sought out the range of applicability of each theory. When I concluded the book, it felt like finishing a long conversation with someone I had come to know and admire. 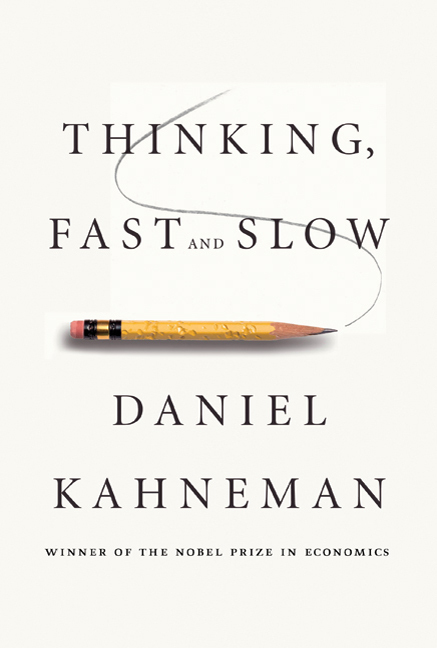 Thinking, Fast and Slow is worthy of a slow and thoughtful read, and I highly recommend it. I love listening to Elaine on The Book Report Radio Show, This week she had this as one of the featured books. I listen to the show online, go to http://www.bookreportradio.com to have a listen.